DAQ Chassis with 8GB DRAM: ACQ2106 with MGTDRAM. D‑TACQ increased the data link bandwidth between the ACQ2106 carrier and the MGTDRAM memory expansion to greater than 1280 MB/s, enabling faster and deeper sampling capability. ACQ2106+2xACQ480ELF, 16 channels x 40MSPS, 1280MB/s, 6s continuous capture. ACQ2106+4xACQ480ELF, 32 channels x 20MSPS, 1280MB/s, 6s continuous capture. ACQ2106+1xACQ482ELF, 16 channels x 40MSPS, 1280MB/s, 6s continuous capture. 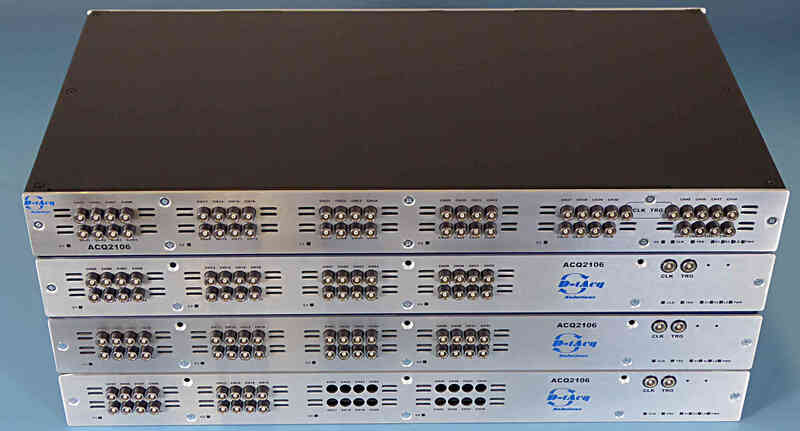 ACQ2106+2xACQ482ELF, 32 channels x 20MSPS, 1280MB/s, 6s continuous capture.